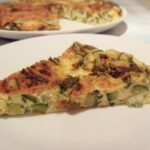 Zucchini and fresh mint frittata: Frittata is amazingly versatile and makes a quick and easy breakfast, brunch, antipasto and party dish. 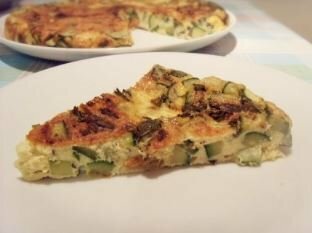 The combination of mint with the zucchini makes this zucchini and fresh mint frittata very light and refreshing. The recipe for zucchini and fresh mint frittata is one of our most popular and from what you have to say, it’s because you can whip this up with very little preparation time and enjoy it at any time of the day. Fry the zucchini, onion and mint in a non stick frying pan until the courgette has changed colour. 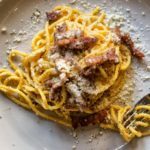 You can do this ahead of time as it will keep in an airtight container in the fridge for a few days. Be careful not to overcook it. (You don’t want mushy zucchini). Season with a little salt. Crack the eggs into a bowl and add the cheese. Mix well. When the courgettes are ready, add the eggs to the pan. Stir for the first minute or so and then wait for the eggs to start to set, shaking the pan from time to time to keep the frittata loose. When the eggs have set, turn the frittata with the aid of a plate, and return it to the pan. The best steak and Guinness pie, ever!